Horse insurance is vital to ensure my horses get the very best veterinary treatment and by insuring through Petplan Equine I know that they will do everything possible to make things run smoothly. Their knowledgeable and professional service makes a potentially stressful situation very straightforward. 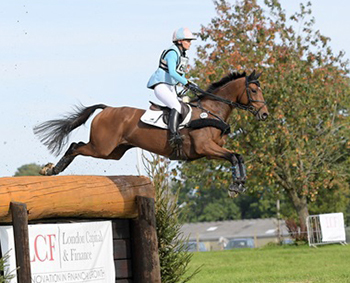 Katie Preston is an equine vet and keen eventer from Kent. Katie believes spending quality time with her horses and knowing them inside out is key to responsible horse ownership. Katie owns three horses: Templar Justice (TJ), Dreams Come True (Tia) and Templar Juno. TJ is a twelve year old TB gelding eventing at Advanced and 5* level. Tia is an eight year old sports horse mare who Katie bred herself who competes at 2* level. At just 15hh, Katie refers to her as her ‘pocket rocket’! Katie’s third horse, Juno, is a five year old who she has had for three years and has recently started eventing. She has a willing attitude and has so far taken everything in her stride. Compete at her first Badminton with TJ! Start Juno’s eventing career with some 5 year old classes (BE100 level) and aim to qualify for Osberton 5yr old Championships.